We’d love your help. Let us know what’s wrong with this preview of Positively Izzy by Terri Libenson. Izzy is the dreamer. 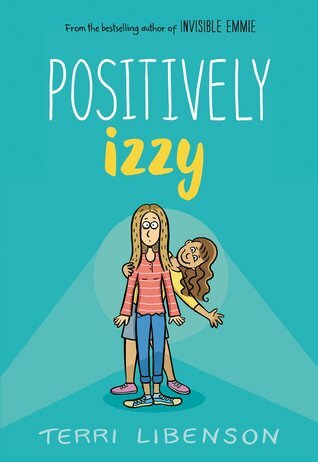 There’s nothing Izzy loves more than acting in skit Award-winning comics creator and author of the bestselling Invisible Emmie Terri Libenson returns with a companion graphic novel that captures the drama, angst, and humor of middle-school life. Perfect for fans of Raina Telgemeier, Jennifer Holm, and Victoria Jamieson. To ask other readers questions about Positively Izzy, please sign up. Does this book have chapters? The newest book, this time we have Bri and Izzy. Well, this was not as good as Invisible Emmie, I was very much confused. And yes, I also was that while reading Emmie's book, but now even more. Way, even more. Even with that plot twist at the ending, sorry, I had to read another review to get what this meant. I am sure if I hadn't read that review (or others) I would have been confused and be like, whut, why is the mom called (view spoiler)[ Izzy. And also thanks to that review I now see that tho The newest book, this time we have Bri and Izzy. Well, this was not as good as Invisible Emmie, I was very much confused. And yes, I also was that while reading Emmie's book, but now even more. Way, even more. Even with that plot twist at the ending, sorry, I had to read another review to get what this meant. I am sure if I hadn't read that review (or others) I would have been confused and be like, whut, why is the mom called (view spoiler)[ Izzy. And also thanks to that review I now see that those aunts are Izzy's sisters. Gosh. (hide spoiler)]. Out of the two girls, Bri was my favourite. Izzy. Eh, not so much. I thought it was dang awesome that she was so awesome with theater stuff, but I hated how she didn't do a crap's worth in school. I get that focusing is hard. I am at at least level 9000 with distraction. :P Yet, even though I kept being distracted, I did try my best at school. And sure, my grades weren't always topnotch, but I tried. And that is what I missed with Izzy. Izzy seemed to not even try. If it was not interesting to her, she would just drop out and go into her little fantasy world. The take out test was just the final drop for me. Telling a bullcrap lie that you didn't know it was a test, sorry, it is saying that in big letters on the front. Sorry, but come on. And then you go all pissy and angry when your mom finally thinks this is enough and gets angry and grounds you. Sorry, but did you really think that after so many times she would just be merciful? I think the mom was pretty tame even. I am glad that in the end she did realise several things that probably shocked her as she apparently didn't care to look around her that much. I can imagine that x did that to her, after all those years, I can imagine that x is just done with it all. Bri, my favourite girl. She has really changed since the previous book. She was pretty dang bossy in there and I know at times I was just angry at her for treating people like dogs or worse. You can see that at times she forgets to say please, or that she acts a bit bossy, but thankfully she notices pretty fast, or else Emmie just looks at her with a look or tells her. You can really see she is taking an effort in being kinder. Good job girl! I loved how studious she was, and she was having fun, in her way. She didn't mind studying, and was pretty happy with her life. I get what her mom was trying to do, but there are other ways to get your kid to have more fun, or get her out of her shell than to force her on a stage. Especially when one only has a few hours. In the end Bri did it, and I was pretty proud, but I was also sad that she had to go through so much stress and fear because of this. It did bring her closer to her friend though, which made me happy. He really helped her out when she needed it the most. And yes, we see Emmie again! Not as much as in the previous book, but she is still there and I am happy that she is doing fine. She seems to have quite a lot of fun in the things she does. Like the previous book one of the POVs is in full comic style, and this time that is Bri's POV. And also like the previous book, this one switches per chapter. One will be about Bri, then Izzy, then Bri. At times it confused me, but generally I could follow it pretty well, and in the end I was an expert. The art was once again fabulous, I just adore the style! All in all, even if I am rating this one a 4 star, I will make an exception for this one and keep it on my shelf. I hope there will be another book in this series, though I hope that the connections between the girls are a bit clearer next time. I didn’t catch the twist on this one till I was about halfway through and then I ended up reading this graphic novel twice so I could truly appreciate it. Honestly, I wonder how many teens/children will really get the twist on this book. I enjoyed the “play” on this book but I think more hints could have been inserted in the novel to make it more enjoyable. There are two stories taking place in this novel constructed of both graphic novel and narration. As you read the novel, there is a clear dis I didn’t catch the twist on this one till I was about halfway through and then I ended up reading this graphic novel twice so I could truly appreciate it. Honestly, I wonder how many teens/children will really get the twist on this book. I enjoyed the “play” on this book but I think more hints could have been inserted in the novel to make it more enjoyable. There are two stories taking place in this novel constructed of both graphic novel and narration. As you read the novel, there is a clear distinction between the two, on which story you are reading. One story is about Izzy who lives with her sisters and her mom. Izzy loves drama but school work, not so much. When her mother discovers Izzy’s failure to keep up with her schoolwork, Izzy feels like her world is falling apart. I liked how this story came together in the end and Izzy’s family. The other story is about Bri, who is smart but doesn’t care about drama. Bri’s mother is the drama teacher at school. At the last minute, Bri is asked to fill in for someone, on stage. I enjoyed watching Bri deal with this new experience and I liked the conclusion. The illustrations were bright and colorful and the text was easy to read. I liked that the author used two different styles, to write the two different stories within this graphic novel, so that it is easier to tell the stories apart. I think you need to read this novel a few times to fully appreciate it (once you understand the twist in the story). Again, I wished the author would have added more in the writing to help uncover the twist as I feel some individuals will not see it and that would be a shame. I would recommend to older elementary and middle school readers, so they can understand the twist or perhaps uncover the twist to other readers, if they don’t discover it after they read it (so they can fully appreciate the novel). I 100% did not get this one. "Invisible Emmie" was such a great look at anxiety in tweens and incredibly relatable -- and this book just didn't make sense. I had to keep flipping back and forth to remember who was who, and then the ending left me utterly baffled. Can anyone tell me why Bri's mom's name is ALSO Izzy??? I don't get it!!!! EDIT: Okay. I figured it out. SPOILERS AHEAD! These stories are told from different timelines. Izzy's story takes place in the past, and she grows up to be Bri's I 100% did not get this one. "Invisible Emmie" was such a great look at anxiety in tweens and incredibly relatable -- and this book just didn't make sense. I had to keep flipping back and forth to remember who was who, and then the ending left me utterly baffled. Can anyone tell me why Bri's mom's name is ALSO Izzy??? I don't get it!!!! I really enjoyed this book! I thought it was amazing! Especially how it changed perspectives per chapter. I personally enjoy books that do that. I recommend this book! I wanted to like this. I recommended Invisible Emmie to several parent friends for their kiddos. This ARC left me confused. The two intertwined stories left me having to go back several time to understand who was being discussed and how they knew each other. I think the intention of intertwining two stories is interesting - this fell super flat. I was so confused when I finished this book... Just read it and then you'll know why. I don't read many junior fiction books but I LOVED this one! It took me back to my Junior High days in a jiffy, like I had never left--the angst, the silliness, the insecurity. I devoured this book between 3:30 a.m. and 5:30 a.m. any attempt at finding sleep gone! I also loved the illustrations. I will definitely look for more of Terri Libenson's offerings! I love how this author puts such amazing twists at the ends of her books! Anyway overall a great book and I recommend this and Invisible Emmie all the way! Before the last three pages i was thinking of 3 stars rating, but the final page plot twist made deserve the fourth star. The ending...I had to do a double take. I liked the two styles of writing to show the stories. Sweet story and the author manages to capture the voice of middle schoolers well- but something about this fell a little flat for me. This review has been hidden because it contains spoilers. To view it, click here. Probably more like a 4.5 stars but I really loved this graphic novel too! It's a companion to Invisible Emmie and follows her best friend, Brianna, as well as a girl named Izzy. Brianna is known as "the brain". She is super smart and quiet and prefers studying over putting herself out there. However, one day her mom (the drama teacher) says there is an emergency and someone has gotten sick or dropped out of an upcoming play that's going to be done in the talent show-- would she step in and do it Probably more like a 4.5 stars but I really loved this graphic novel too! It's a companion to Invisible Emmie and follows her best friend, Brianna, as well as a girl named Izzy. Brianna is known as "the brain". She is super smart and quiet and prefers studying over putting herself out there. However, one day her mom (the drama teacher) says there is an emergency and someone has gotten sick or dropped out of an upcoming play that's going to be done in the talent show-- would she step in and do it!? She is terrified, but she says okay. It's a scene with a boy named Dev, and with his help she gets through it. Their friendship is really sweet and fun to watch develop. Izzy is the middle of 3 sisters. She has a really hard time focusing and does not do very well in school. She likes drama and theater, but the rest of school is a struggle. She gets in trouble for her grades and her mom says she can't participate in the play (at the talent show) but then she sneaks out and goes anyway. Her mom catches her, but her sisters stand up for her and so she's allowed to participate (and then be grounded afterwards). In the end, the big twist (like Katie being an imaginary drawing of Emmie's in the first one) is that Izzy is Brianna's mom! I should've seen it coming- Mom's a drama teacher, Izzy is only good at drama- but I was still surprised. Again I love the way that the author captures the feel of middle school and has very realistic characters. My only complaint with this one is that I felt that Izzy was a little weak. I had to pick this book up and down a lot and sometimes I'd struggle to remember exactly what Izzy's story line was supposed to be and what her character was like. I wish there was a little more to her or her story, but it was still good anyway. I reeeeally liked the plot of this graphic novel, even more than Invisible Emmie. It was fun getting to know Brianna better and see a bit of Emmie, and I enjoyed Izzy's part of the story too. Both Izzy and Bri's character development was good and I definitely didn't see the big twist at the end coming (even though it was fairly obvious, after the fact). I'm looking forward to re-reading this book in the near-ish future to experience the story again, from the beginning, and see how everything play I reeeeally liked the plot of this graphic novel, even more than Invisible Emmie. It was fun getting to know Brianna better and see a bit of Emmie, and I enjoyed Izzy's part of the story too. This review has been hidden because it contains spoilers. To view it, click here. Well, I also had to read other reviews to understand the grand reveal at the end, and it hardly seemed to make sense. Throughout, I kept wondering why they never bumped into each other during the talent show and why the focal point cuts away during the other performances (I thought Izzy's skit was the one before Bri's, where they received laughs and applause). Think I would have enjoyed this more had they been separate books, allowing us to understand Izzy, and then a second volume (or second ha Well, I also had to read other reviews to understand the grand reveal at the end, and it hardly seemed to make sense. Throughout, I kept wondering why they never bumped into each other during the talent show and why the focal point cuts away during the other performances (I thought Izzy's skit was the one before Bri's, where they received laughs and applause). Think I would have enjoyed this more had they been separate books, allowing us to understand Izzy, and then a second volume (or second half) where you see Bri and slowly understand that the Aunts are the sisters...making Mom = Izzy. This was a fun, quick read. I love reading books about artsy, geeky kids. I wish there had been more books like that when I was growing up. I didn't understand the ending until a student explained it to me, and then I had to go back and find the clues that I'd overlooked the first time. That was a fun little adventure to have after the end of a book. Once I understood the ending, I liked the book even more. Cute graphic novel about two middle school girls who don't know each other, but whose lives briefly converge at the school's talent show. I suspect the author took liberties with each girl's "epiphanies" because, when I was that age, I had absolutely no clue who I was or the confidence and self-esteem to like myself, despite my parents' unconditional love. But this kind of story is nice to read in hindsight and wish for "what might have been." Quick, entertaining, and satisfying middle school story that altermates between text and graphic novel formats. Two very different characters with parallel storylines that eventually intersect. Fans of Drama by Raina Telgemeier will like this too. Libenson’s sophomore graphic novel wasn’t a slump! Hoping she’ll have something up her sleeve for summer of 2019. Terri Libenson's books always have some sort of twist, but I was not expecting this at all! It was good... but not like her first one! Maidie: I like how Bri tried something new- drama. The book is a little bit bad because kids can get ideas about going places by sneaking out of the house. 1. I love that this author always has a twist and Brianna’s mom being Izzy was perfect. 3. This was a great little story of growing up and finding your way. 4. I also liked the message that you don’t just have to be one thing. Not just brainy or artistic or dramatic. You can be many things. Terri graduated from Washington University in St. Louis in 1992 with a BFA in illustration and a minor Terri Libenson (pronounced LEE-bensun) is the cartoonist of the internationally syndicated comic strip, “The Pajama Diaries.” She is also an award-winning humorous card writer for American Greetings Corp. She has written for AmericanGreetings.com, Egreetings.com, and BlueMountainArts.com as well.